We always think of Sicily as Italian – and it is, of course – but under the surface, the island is a huge confluence of cultures and influences, stretching back for over 2,000 years. Romans, Vandals, Byzantines, Arabs, Normans and Catalonians have all called the island home at one time or another, and those influences are still echoed in Sicilian cuisine, which mixes the dried fruit, nuts and spices of North Africa with the fresh meat and cheeses of Europe and Italian staples like pasta and fish. Aubergines arrived in Italy via Sicily and North Africa, and they're still a vital part of many classic Sicilian dishes. Aubergine parmigiana, Caponata and Pasta alla Norma are all very traditional, and great starting points if you're looking for something simple and delicious for dinner. Bottarga – cured, pressed tuna or mullet roe – is another typical Sicilian delicacy. If you manage to track some down, Ciccio Sultano's Spaghetti with bottarga sauce is a perfect way to put it to good use. Once you're ready for something a bit sweeter, you can't go wrong with a cannoli. Antonella la Macchia's Sicilian cannoli is a classic recipe, but give Roberto Petza's Crunchy cannoli with cardamom cream a go too – it's a bit different, but just as delicious. 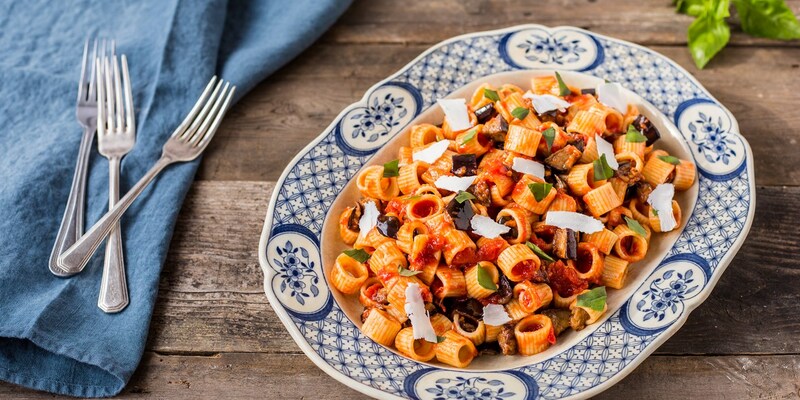 This is just a taste of Sicily, but there's plenty more to get stuck into in our full collection of Sicilian recipes. Scroll down and take a look.